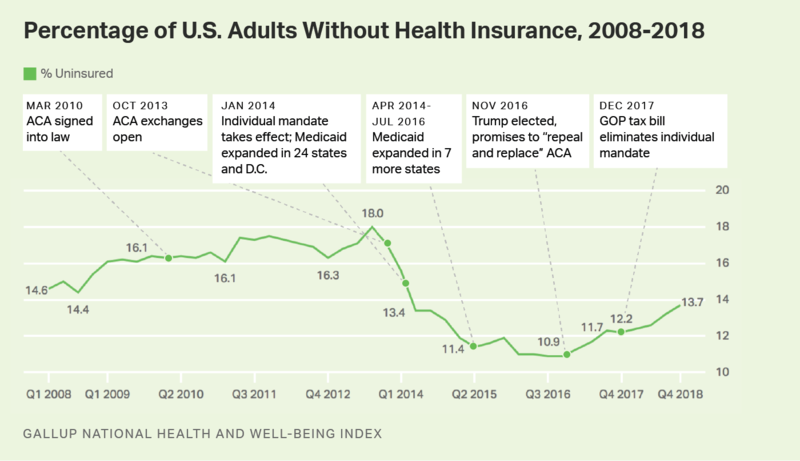 The uninsured rate rose for most subgroups in the fourth quarter of 2018 compared with the same quarter in 2016, when the uninsured rate was lowest. Women, those living in households with annual incomes of less than $48,000 per year, and young adults under the age of 35 reported the greatest increases. 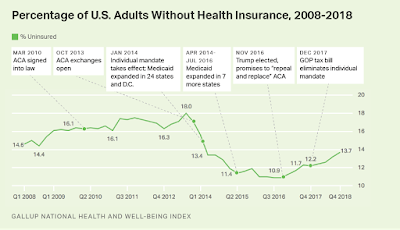 Those younger than 35 reported an uninsured rate of over 21%, a 4.8-point increase from two years earlier. And the rate among women -- while still below that of men -- is among the fastest rising, increasing from 8.9% in late 2016 to 12.8% at the end of 2018. At 7.1%, the East region, which has in recent years maintained the lowest uninsured rate in the nation, is the only one of the four regions nationally whose rate is effectively unchanged since the end of 2016. Respondents from the West, Midwest and South regions all reported uninsured rates for the fourth quarter of 2018 that represent increases of over 3.0 points. The South, which has always had the highest uninsured rate in the U.S. but has seen some of the greatest declines at the state level, has had a 3.8-point increase to 19.6%. Quality of life is often impacted more by social policy than individual choice. The policies of the Republicans have been major obstacles to improving health care in the United States which may have been a major reason in their historical defeats in the 2018 elections. 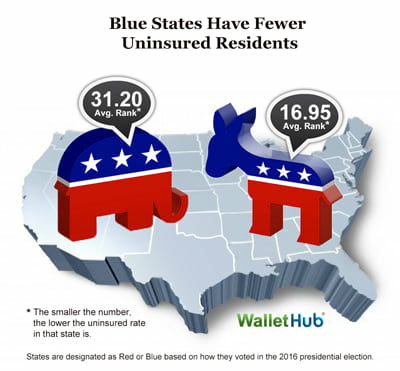 In general, citizens in Red states have much poorer health care coverage than in Blue States. How lies become the new truth. What's the deal with re-cycling plastic bags? Media literacy - When can you believe your eyes? What's your purpose in life? What's the deal with textbooks? What are nine signs of burnout? What would you ask a philosopher? Media literacy - Can you believe your lyin eyes? Media literacy - Can you spot a "dog whistle?" What do medical social workers do? Is it helpful to talk about past abuse?